Designers Gail Drury, CMKBD and Jason Wickline of Drury Design teamed up with Ginny Blasco, ASID of Ginny Blasco Design Studio to create a contemporary rustic lodge oasis. 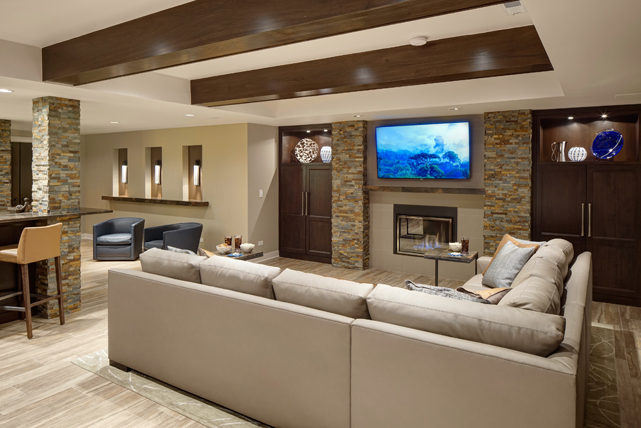 The client’s goal was to create a contemporary rustic basement with natural tones and materials, along with clean and sleek lines. Their wish list included an entertainment space, a game area, a bar with visually appealing wine storage, a music room, an AV room, and of course what every basement needs – storage space.